as i try to figure out what it is i want to do in my life beyond teaching, i spend a bit of time looking on the internet, looking at design and what so many people are doing out there. i am amazed by the people who document their new creations, be it clothing design, hand bags, aprons, stuff animals, interior design, printmaking and recipes. i find myself looking into people lives, how they live and how they share their ideas and knowledge. i've been adding to my links as i hope people will check these out. i also thought i would start to post my inspiration for the day. 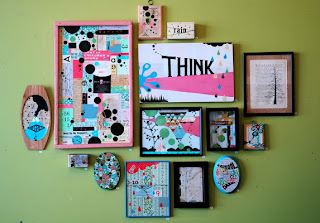 today's inspiration is lisa Congdon , a self-trained artist who makes wonderful works of art and crafts. I love how we fight so hard to go back into our past to find the images that effect us the most. fighting to "unlearn" what we learned in art school. seeing that Lisa was also borned in the 60's I feel a connection is the imagery that she treasures. 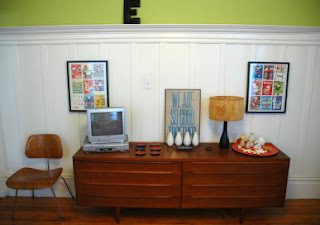 i posted images from designsponge. of Lisa's interior. 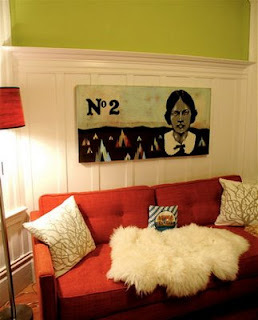 check out design blog for additional pics and commentary by Lisa. i find it funny that we have the same tea green color in our living room.